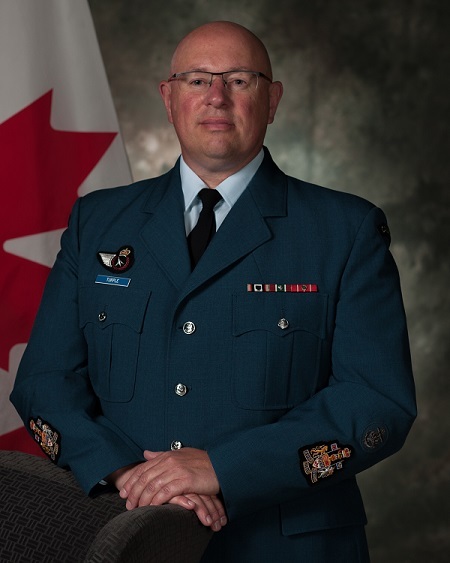 Chief Warrant Officer Turple joined the Canadian Armed Forces in March 1990. After basic training in Cornwallis he then completed the Performance Oriented Electronics Technician (POET) training at CFB Kingston and the Integral Systems QL3 training at CFB Borden. CWO Turple was posted to Cold Lake, AB in 1991 and while there worked on the CF-5 in 419 Sqn, the CF-18 in 441 Sqn and finally in 1 AMS in the Automatic Test lab. In 2002 he was posted to 443 Sqn in Victoria, BC working on the CH-124 and sailing on numerous RCN frigates, including a memorable deployment to the Arabian Gulf in 2005. In 2009 CWO Turple was attach posted to 408 Sqn and deployed to Afghanistan with the interim D model Chinooks. Upon return to Canada in 2010 he assumed the role of Test Equipment Coordinator at the Calibration Centre in FMF Cape Breton, CFB Esquimalt, followed by a very challenging year of Second Language Training in 2011. Upon successful completion of the French course he was posted to Garrison Petawawa, ON to help stand up 450 THS in preparation for receiving the first CH-147F Chinooks into the RCAF. While with 450 THS CWO Turple helped the unit gain Provisional Accreditation as the AF9000 Quality Manager just as the first aircraft were delivered in 2013 and then helped establish the Standards section for the Fleet Technical Training Flight. This was quickly followed by taking on the position of Chief Instructor of the school where he helped establish an innovative technician training program. CWO Turple was promoted to his current rank in 2017 and was most recently the Squadron Chief Warrant Officer of 413 Transport and Rescue Sqn. He is happily married to Kim and they have two wonderful children, Benjamin and Megan.